We went on holiday last weekend. For the second time in nine years of living on a holiday island my husband and I went away and stayed in a hotel. The first time was in 2005 before our daughter was born, it was up in a hotel with a terrible atmosphere in Soller, the married couple who ran the hotel were not very happy with each other, the following year I believe one of them killed the other, and it rained constantly for the two day stay, all in all, not the greatest success. Last weekend, as we left the house, the sun went in and it started to rain, well, we joked, this was par for the course. We´d decided to go up to Canyamel, to an all-inclusive hotel (we went for half board, you couldn’t book just B & B). It took about an hour to get from our front door to the hotel, or to put it another way, about 15€ in gas. The room was comfortable and clean, sufficient for us. After we had checked in we headed straight down to the beach for a looksee, it was beautifully windy and fresh: the sea cresting with waves as they hit the shore. 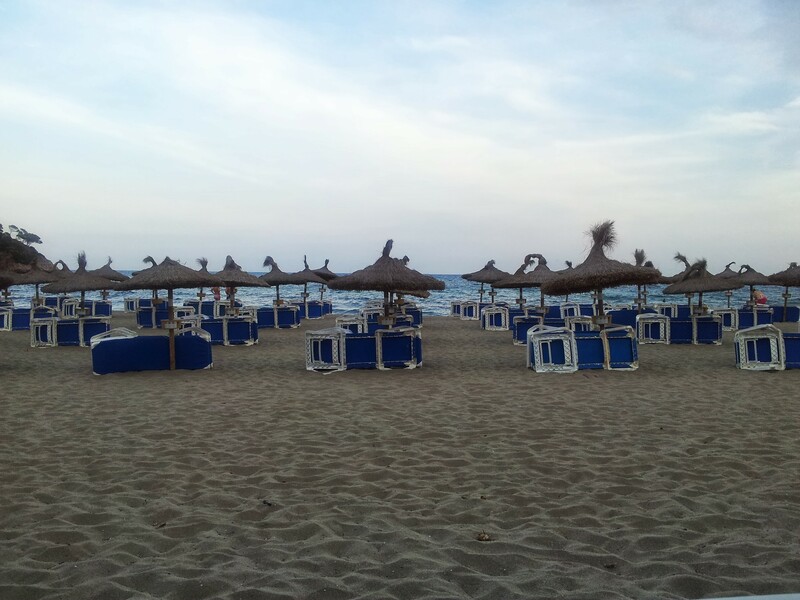 We found quite a cool looking chiringuito and pulled up a couple of chairs and swiftly made our way through three beers and two large glasses of wine which cost us the grand sum of eight euros all in. That was when a refrain from Annie The Musical started to run through my head, “I think I’m gonna like it here!” And I did. We nipped up to Cala Ratjada after our all-you-can-eat dinner. I fell in love with the marina immediately. It’s in a horseshoe shape and has bars and restaurants right around it, and the best thing about Cala Ratjada? It was absolutely packed with people. The atmosphere was buzzing, we loved drinking our Hierbas and cafés con leche whilst watching the hordes promenading along the front. The next day we went down to Porto Cristo in the rain and had a top lunch in a smashing Spanish restaurant called La Esquina (highly recommended: bacalao with fennel, John Dory with spinach, and then the Gato (almond cake) with homemade almond ice cream, a bottle of wine, a few more drinks, coffees and another (cough) pudding, all in for just over 50€. We’ve got pretty used to the cost of living in SW Mallorca but when you go outside of that area it seems as if perhaps the prices are a little lower than we were used to. It rained on and off all afternoon so we explored some caves. In the evening we went back up to Cala Ratjada and ended up in a fun bar with a lovely swimming pool and fountains called Cocos Pool, welcomed in by Maria and sunk a few cocktails. Well, it would have been rude not to. We’d only been gone for about forty hours, but we really felt like we’d been far, far away. The next morning after we´d checked out we drove back to Palma back to work. Sun came out, of course.